The GoDaddy mobile app is your one-stop shop for all the tools and help you need to succeed online. 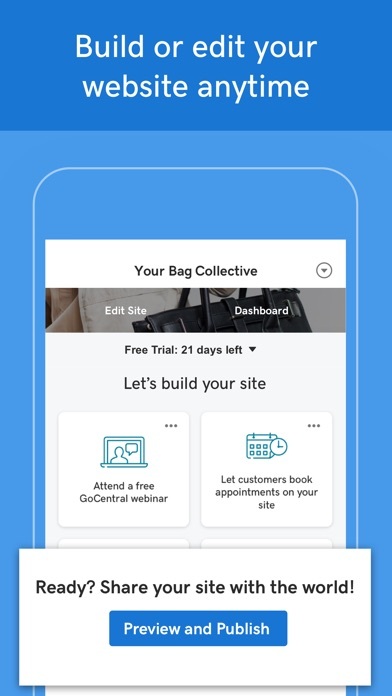 Whether you’re at home, in the office or on the go, stay on top of website performance and complete tasks faster – right from your phone. 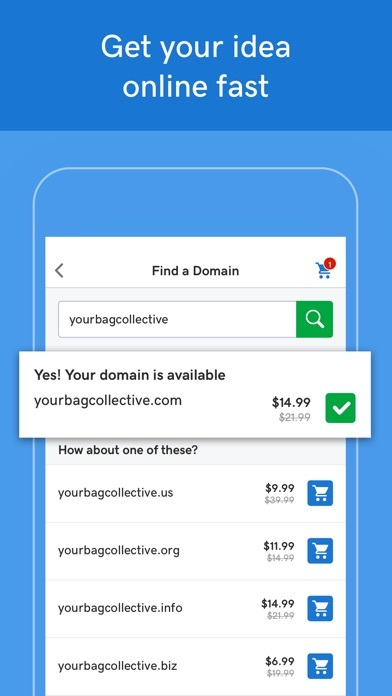 With the GoDaddy mobile app, you’ll see just how easy it is to buy a domain name, build and manage your website, and always know what’s happening with your business. It makes all those timely tasks simple. You even get personalized advice on how to grow your online business, all from your phone. What you can do: 1. Find the right domain Get your idea online fast. Easily search for, register and buy a domain name. 2. Create your website Build and edit your website anytime, anywhere. GoCentral Website Builder is the simple way to create a better website using unlimited designs tailored to your industry. Start with a 30-day free trial. 3. 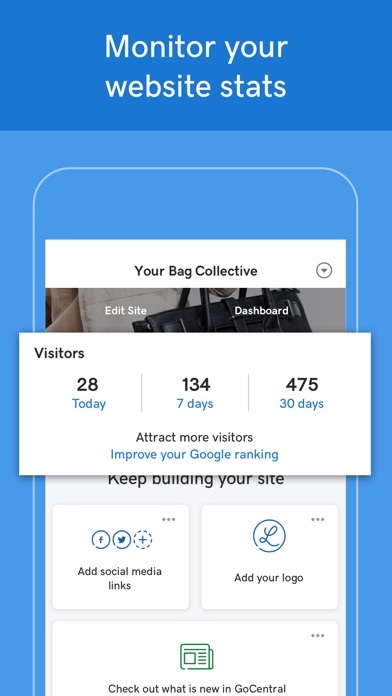 Monitor your website performance Know at a glance how many people are visiting your website, whether there’s been an increase or decrease, and additional details to help you stay on top of it all. 4. 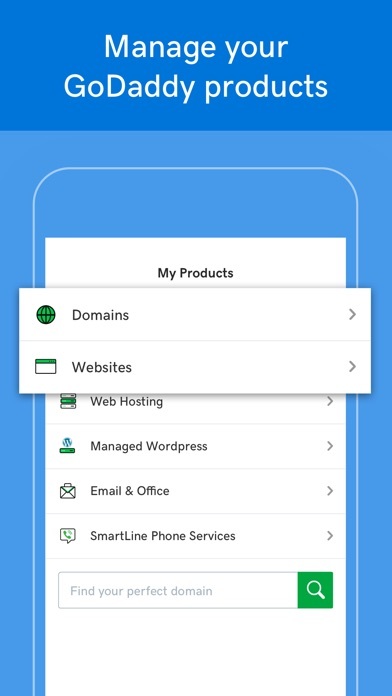 Manage your products and services on the go Manage and renew your GoDaddy products anytime, anywhere – the app makes it quick and easy. 5. 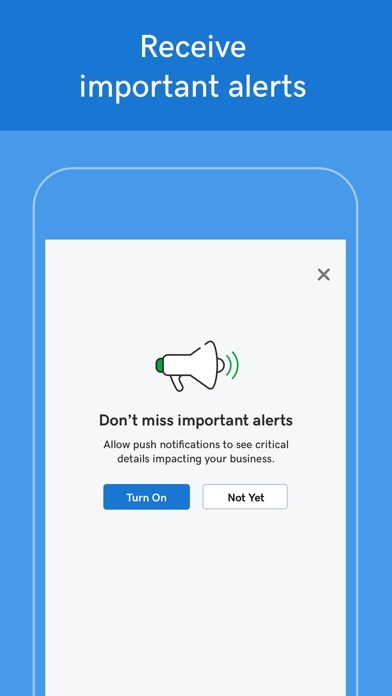 Get notifications for important actions Keep up to date and avoid interruptions with important account notifications. 6. Gain personalized insights and grow online Get actionable recommendations for what to do next. Learn how to get the most from your domain, website and additional GoDaddy products. It’s the app for helping any business build a successful online presence. Download it for free. For further information or assistance, email us at appfeedback@godaddy.com. 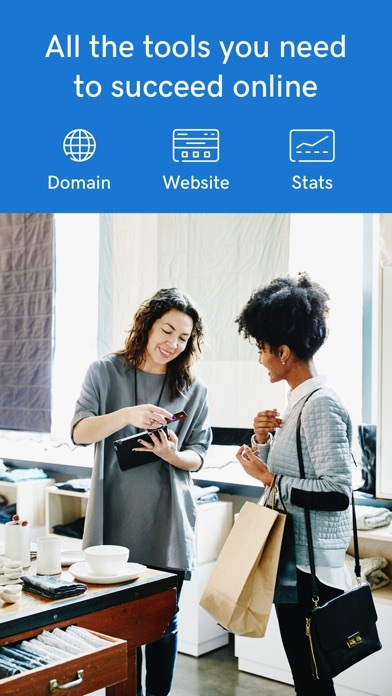 It’s the app to help any business build a successful online presence. Download it for free. For further information or assistance, email us at appfeedback@godaddy.com. Go daddy is one of the worst website domain, builders and everything. They keep on pushing services and even try to put them on by making you click something in the accident or just annoying you to the point that you just want it to be off. Do not use this service I’m telling you do not use their service they overdraft my account by over $200 and not in one day they kept on doing it over a week. Even though I didn’t have auto renew on one of the domains they still charge my card just because I think I had it on the account or I don’t care they made me so mad. Do not I warn you do not use their service!! I just downloaded the app and didn’t get any further than the first couple of screens. It’s gave me a phone screen that stayed in portrait mode. I do everything on my iPad and don’t have the patience to screw around with a phone sized screen. If I did I’d use my phone. Yes, I’m a curmudgeon and this UI is not going to get me to use this app. Fix this and I’ll try it again. The Golden Rule in upstanding, online-service. Y’all are the greatest of all time. Best personality’s ever!!!! 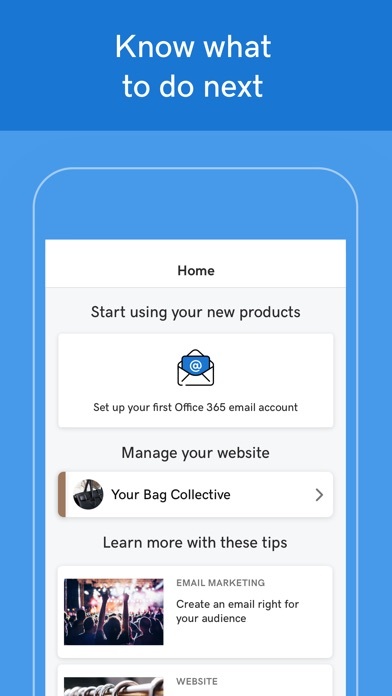 No mobile access email app. Bummer. Unlike the one star reviewer, I have had great success with GoDaddy for the most part. This app is not one of them. Just got word of an email address down and when I downloaded it just to check what accounts were still showing, nothing happened. It shows that I have email and forwarding account contracts, but hitting any of them does nothing. I cannot access them let alone change them and no error comes up. One would think that a company specializing in online business development tools would not have such shoddy tools to work with for their own business.